I’m in the middle of moving … housesitting various places and living out of a suitcase while waiting for a bathroom to be completed in a lovely light-filled cottage in Uralla, a village fifteen minutes away from Armidale. Being caught in limbo land like this is a little challenging, but I’m trying to remember that change is a wonderful thing and that opportunities are flowing with change. It’s true. Lots of opportunities are arriving into my life – creative projects, work ideas, travel plans – and I’m also meeting some wonderful new people. About a year ago, when I was stuck in the editing wilderness of Wild Boys, I wrote a song called ‘Caravan Dreaming’ – about longing to escape in an old caravan I bought for my son’s 19th birthday. In a way, that dream has come about – all I’m missing is the caravan. I’m certainly living the gypsy life, and being temporarily homeless is teaching me some important lessons. Speaking of songs, I’ve now completed the lyrics for fourteen songs for a ‘cradle to grave’ song-cycle collaboration that I’m doing with a local Armidale composer. Only two more songs to finish and I’ll be done with the writing. My collaborator has also been hard at work and has so far set eight of the songs. I’m really enjoying working on this project – it’s very exciting to hear my words set to beautiful music. Actually, it’s mind-blowing … and I just love it! The other day, I heard six new songs that my collaborator had set over the Christmas break, and it was one of the top experiences of my life. More! More! I’m already planning the next project … collaborating is addictive! Meanwhile, sales for Wild Boys are going well. Over the last few months, I’ve been promoting the book through a series of guest talks at local clubs in the New England region – such as Rotary and Zonta. People from all walks of life seem interested in the book – parents, educators, school counselors, social workers and truancy officers – and that’s a wonderful thing, too. 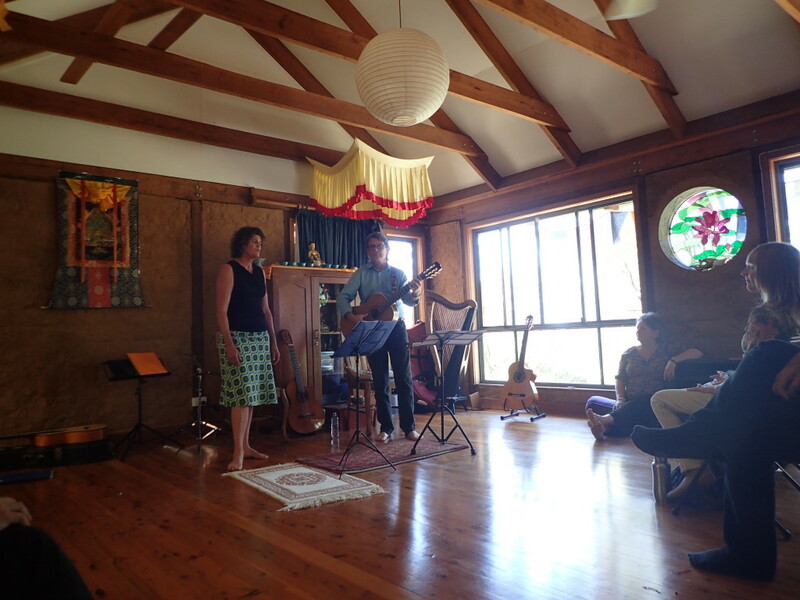 Finally, below is a photo from a performance of ‘homespun songs’ that I did with Chris Purcell and some other friends at a Buddhist gompa on a friend’s property late last year … such a special place to sing.